Community gardening is practical tool for the application of sustainability, while combining between society and environment. Practically, it’s a shared structure of a group who sees itself obligated and responsible for fostering and cultivating a lot of land. The cultivation can be reflected in various ways, by the requirements and wills of its members: personal and/or shared plots of ornamental and edible plants, an orchard with paths and benches, a wild lot that citizens take responsibility on its cultivation- each one of these options or a combination between them- while the common ground for all are the relationships that a community gardens creates- between citizens and themselves and between citizens to the nature and the soil in their living environment. 2. Straightening community bonds- a teamwork of individuals and groups in the community working together for a common goal, while sustaining relations of equality in a multi-age and multicultural group. New acquaintances contribute to tightening relations between people in the community. Family activity in the garden provides an opportunity for spending a significant quality time. 3. Improving neighborhoods’ appearance and their public image- straightening local pride and bond between citizens to their neighborhoods, as well as contribution to a rise of real estate in this area. The citizens take responsibility for fostering a public space in a reduced cost, as opposed to high budget landscape design, while proving a real solution for public needs and community development. 4. Environmental education- the community garden is “the” center for increasing the awareness and learning environmental educational contents at any age, such as: urban nature, sustainable agriculture and health nutrition, reducing consumption and recycling. 5. Growing food- vegetables and fruits, as well as herbs, medicinal plants, flowers, etc. 6. Preserving and fostering – a variety of biological local wild plants and animals. Expanding the aesthetic and functional variety of open grounds. 200 community gardens are active today in Israel and new additional gardens rise every month across the country. Several gardens are supported by municipal authorities, some of them are supported by organizations like: Hahevra Lehaganat Hateva (The society for the protection of nature in Israel), The company for Community centers, schools and pre-schools, community centers, etc. Simultaneously, some gardens are totally independent-as a local community initiative of an individual or a group. Recently, a group of people, devoted to the idea of community gardening, has started to formulate for the purpose of founding the organization “ The Organization of activists for Community gardens in Israel” (temporary name). The organization is led by active community gardens members from all around the country and by professionals in the fields of environmental education, social services, community services, gardening, planning, design and many more. 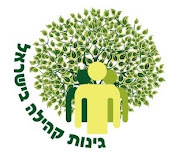 A greenhouse in the service of community gardens activists- encouragement, instruction and support for the citizens in the founding and ongoing activity stages of community gardens in Israel. It’s gardens activists’ home for sharing knowledge and learning together. 1. Supporting community gardens’ activists in the process of founding, ongoing activities and dealing with crisis. 2. Founding a network of activists for community gardens that would be an wide open space for transferal and sharing information about community gardening in Israel between citizens. 3.Promoting collaborations- between activists themselves and between garden activists to authorities and organizations. 4.Raising the awareness for the idea of community gardening among the citizens and decision makers in the relevant Israeli organizations. 5.Operating with authorities and organizations in order to improve and establish better conditions supporting foundation of community gardens across Israel. Creating platforms that support and guidance in the fields of gardening and community. - Community activists- can address the organization with any need of support in the founding or development of community garden. - Authorities’ representatives- are welcome to address the organization in order to receive instruction how to develop community gardening in their area. Main funding and support for organization’s activities would be kindly received from individuals/ funds/ external organizations that would acknowledge the value of community gardens and the necessity of a national organization to supports them.